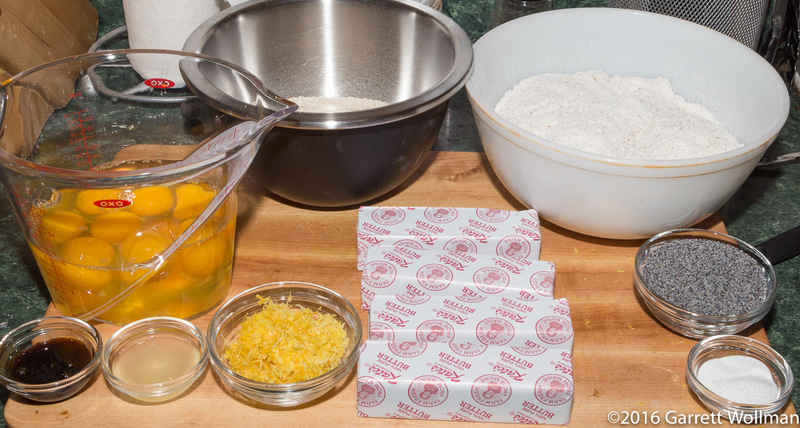 Since this is a lemon–poppy seed pound cake, there must obviously be some lemon and some poppy seeds. I used 50 grams (about a third of a cup) of poppy seeds, the zest of two lemons, and two tablespoons of lemon juice to provide those flavors. Only one tablespoon of the juice went into the cake proper, and to neutralize the acid (and also to provide additional lift to the cake) I used a half-tablespoon of baking soda. Three-quarters teaspoon of kosher salt helps to balance out the flavor profile. I ended up using 480 grams of whole eggs, since the eggs I started with were not uniformly sized so I couldn’t get to the target 450 grams (that would be nine large eggs). I also added two teaspoons of vanilla paste. Like any pound cake, this is made by the creaming method: first the butter and sugar are creamed together until light and fluffy (8–10 minutes), and then the eggs are added, one at a time. Then the flavoring ingredients are added, and finally the combined dry ingredients are stirred in, in three lifts. If you add up the masses of the major ingredients, you end up with about four pounds of cake batter. That’s a bit too much for a standard tube pan, so I ended up putting about three fourths of the batter into the tube pan, and the remaining quarter into a 4×8 loaf pan. I baked the two together in a 350°F (175°C) oven for 45 minutes, until a skewer inserted in the middle of each cake came out clean. 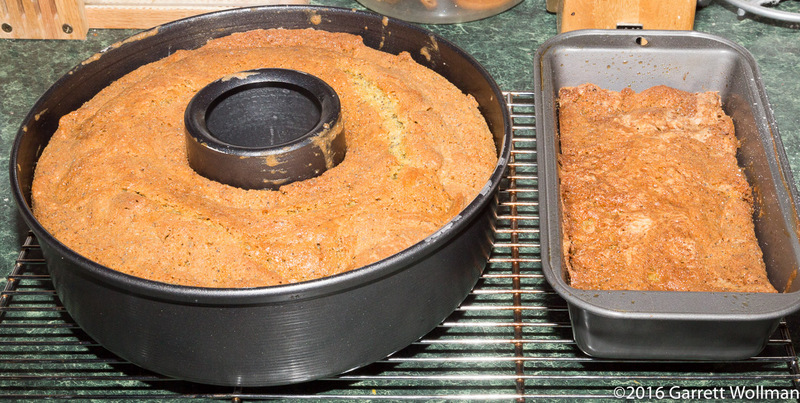 The one-pound cake in the loaf pan ended up a bit too small, and stuck to the bottom; two pounds in a 9×5 loaf pan might well have been a better choice. The three-pound ring cake turned out a bit closer to standard. I turned the still-warm cake out of the tube pan and applied a glaze made from 200 g of confectioner’s sugar and the remaining lemon juice (with a little bit of water added for consistency). We had a snowstorm on Monday, and most of my coworkers didn’t make it in to work, but those few that did seemed to quite like it. I didn’t even cut in to the large ring cake, preferring to preserve it for a better occasion. Luckily, Tuesday is our monthly group lunch, which should ensure that everyone gets to try some. 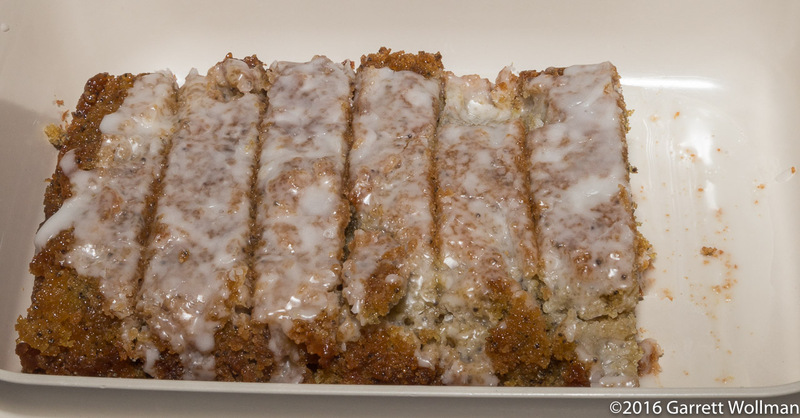 It’s moist, lemony, with just the right amount of poppy seed, and by the time you read this, it will probably all be gone. 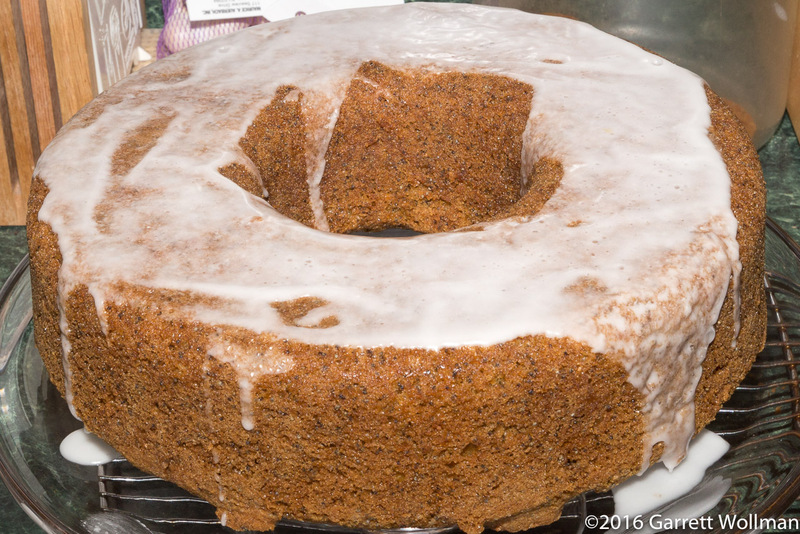 This entry was posted in Food and tagged cake, lemon, poppy seed, pound cake. Bookmark the permalink.